What, ladies and gentlemen, is this? The problem with the “environmental problem” is that (unlike the water bomb) it’s so bloody big. And not only is it absolutely humungous, there’s the horrible and distressing knowledge that much of it could be solved in an instant if only THE IDIOTS would listen to us. It’s enough to make you swoon into a funk. So after you’ve shouted at the internet or the telly because some amalgam of global corporations have once again stomped all over the community’s wishes for <consumer deposit legislation / better urban planning / insert whatever appropriate cause> then it’s useful to gather yourself up and head towards the nearest group of likeminded folk. 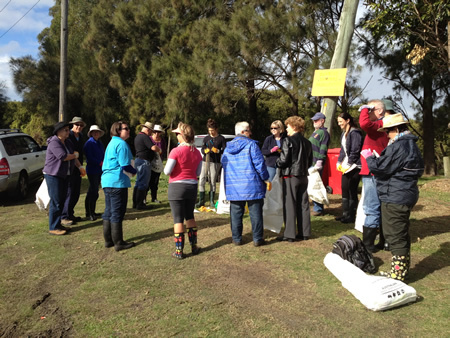 This weekend I went to Tighes Hill Public School to learn how to identify litter. No, seriously. Because this is a serious business. 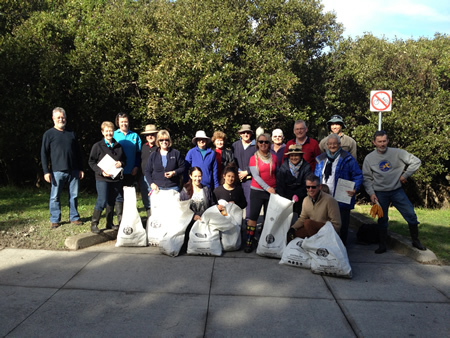 The Ocean and Community Care Initiative (OCCI) hosted the morning, supported by the HCRCMA, and introduced about 15 of us to the concept of litter logging. Here we all are, ready to go by the Carrington mangroves. Here’s the editor the OCCI newsletter, about to go insane after logging his 13,915th Minty wrapper before chucking it in the dirt bag. After 50 minutes we’d picked up, logged and bagged about 50+ kilos of stuff. On recent beach walks these heroes gathered and logged over 500 kilos of rubbish over a 6 km stretch. All the data then goes off to Tangaroa Blue and is entered into their online database. And then we send it off to The Man. In your face, neocapitalist pigs! It’s one of those tasks that seems just too brain-sappingly large to contemplate, but I know that it has a purpose. And a good one at that. So I’m getting me a kit for the Styx and I’m going to start logging the crap that comes bobbing down the beck. 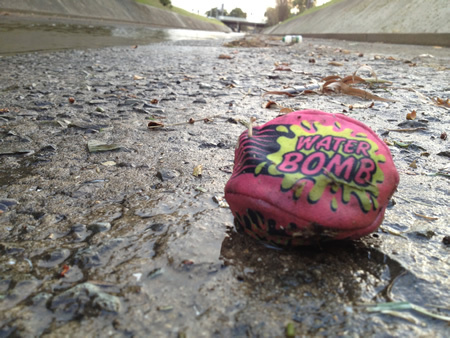 Now, was that water bomb a piece of soft, fabric-based marine pollution, an hilarious toy or a foam death trap? 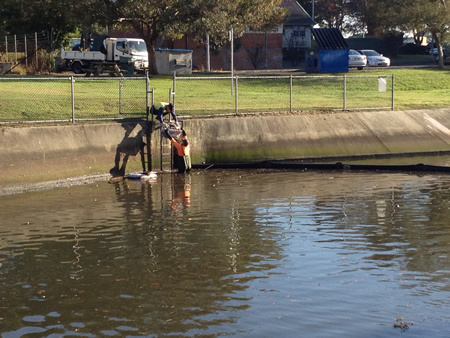 Residents of the lower Throsby Creek catchment regularly see litter building up among the mangroves along the creek, particularly at Smedmore Cove on the Carrington side of the Hannell St bridge. While the mangroves trap the litter here temporarily, the  tides dislodge it and carry it out to sea, where it endangers the lives of sea birds, turtles and other marine  life. 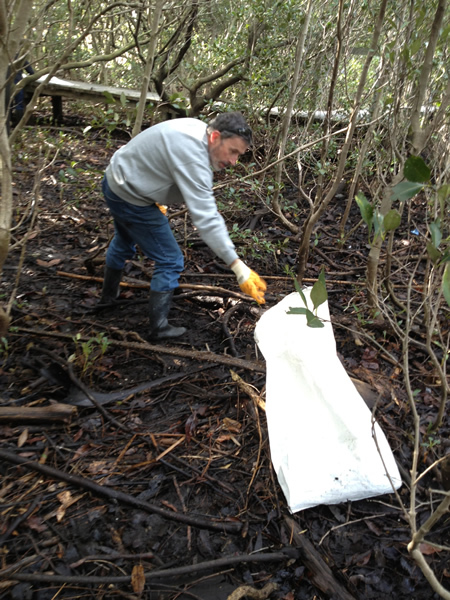 The Lake Macquarie-Newcastle arm of Ocean & Coastal Care Initiatives (OCCI) have been invited to train interested residents in collecting and surveying litter that has gathered in the Throsby Creek catchment and assist them in adding their findings to a national database as  part of the Australian Marine Debris Initiative. By doing this we’ll not only be improving the amenity of  natural areas in our neighbourhood, and potentially  saving the lives of marine animals, we’ll also be contributing to a national picture of marine debris on our  coasts and building a case for action from manufacturers and retailers of the products regularly found in our  waterways. The training is this Saturday, 22 June 2013, from 9.00 am – 1.30 pm. Venue is Tighes Hill Public School; morning tea and lunch provided. If you’re interested, contact Ingrid on 0405 761 593 or email <lake.macquarie.newcastle@occi.org.au>. I’ll be there. Might see you too! When Trevor Dickinson was doing his 100 Letterboxes project he walked many, many streets of Newcastle, ordinary suburban streets that he’d never otherwise walk down, on the search for unusual letterboxes. He took his dog with him, partly for the dog’s benefit but mainly so that he wouldn’t look like a nutter or a pervert with a camera. And he enjoyed it, this endless variety. Me? I enjoy variety too, yet my walks with Jambo are almost always the same. The recent wet weather kept us out of the creek and so I had to go to my B, C and even D walks. Which were fine, nice, but Sunday morning was sunny and dry and the tide was down so we were restored to our default setting: Walk A.
Firstly, the night-soil lane. This is where it all begins, like most of the meals that I cook (i.e. start frying some onion and garlic in olive oil and then decide what I’m going to make). 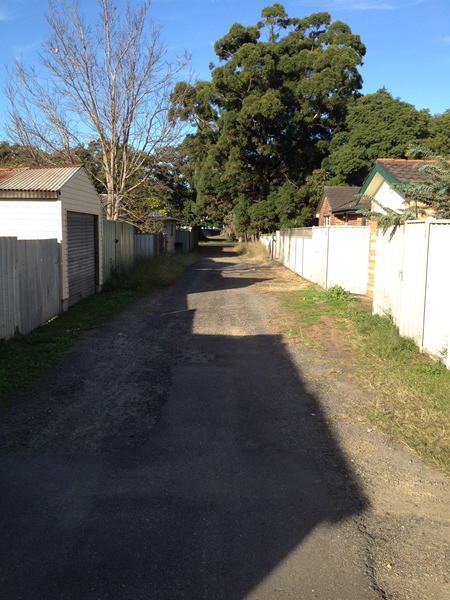 I feel like I know every fence and every chink and nook in every fence along this lane. Which dogs will bark at me from behind which galvanised wall, which puddle will have a dead rat or two floating in it, which patch of grass will have a discarded Maccas bag that I’ll have to tear Jambo away from. There are of course any number of places where we could drop into the creek but this is the point where I go down 99% of the time. There is a reason; there’s always a reason. In this case it’s to do with the camber of the grass banking and the amount of ledge to break your descent against before you go down the concrete banking. A metre either side and it’s just … different. 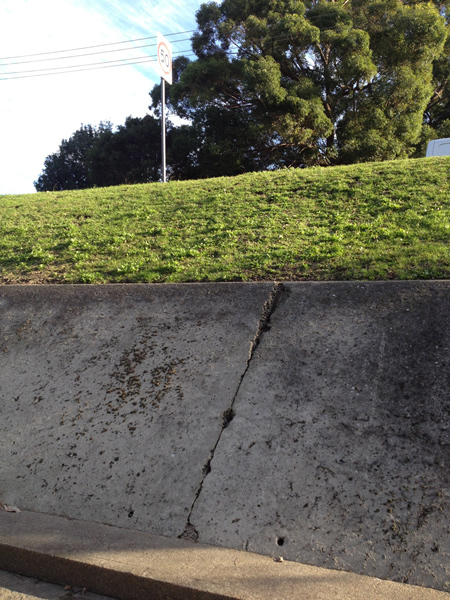 Not enough ledge, too much slope, grass to slippy. So this is where we go down. The side of the creek that I walk down depends on where I’m going, but also on the time of year. In summer, when the creek bed’s dry and the tides tend to be lower, I favour the northern side, which also has better shade. But in winter, when the tides are higher and it rains more and I want to feel the sun, the northern side stays wet and slippy till well into the middle of the day, so I stick to the southern side. 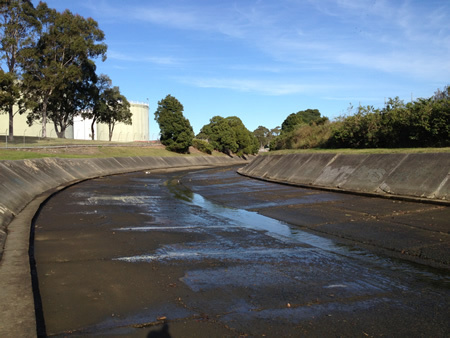 Here’s the junction of the drain and the real Styx Creek. I always paddle across the same bit. Always. 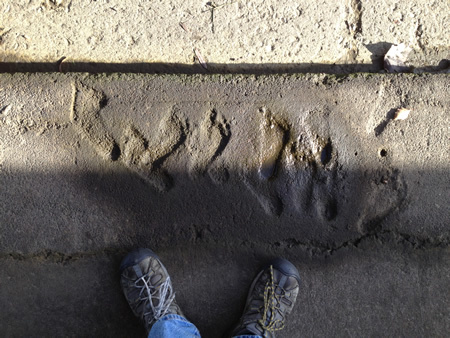 And under the rail bridge I always look at this collection of kids’ footprints. When were they made? Who made them? 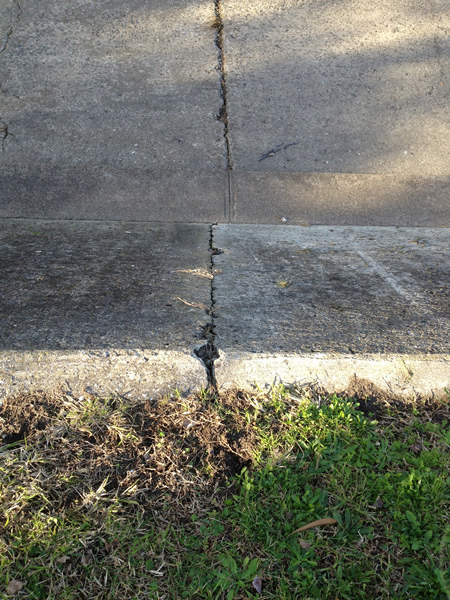 I can see them now, sneaking up after the concreters have left and wiggling their bodies to and fro so that their feet sink into the drying concrete. Maybe two or three friends, or siblings. How old are they now? Are they still alive? I think about them every day, I really do. 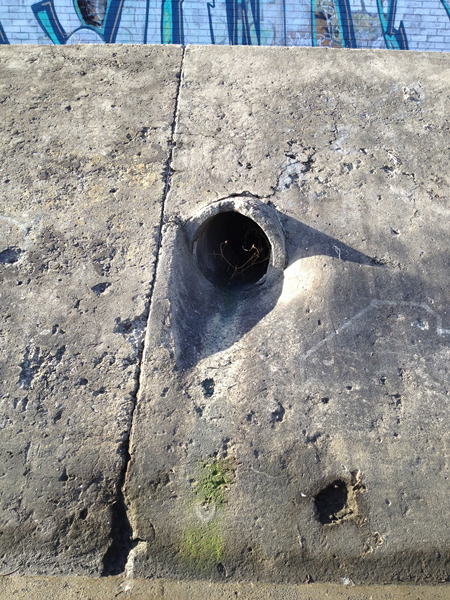 This is the point on the Islington side of the railway bridge where we go up the banking. The soles of my shoes are usually a bit wet by now and so this pipe makes it easier to get up without slithering back into the drain. 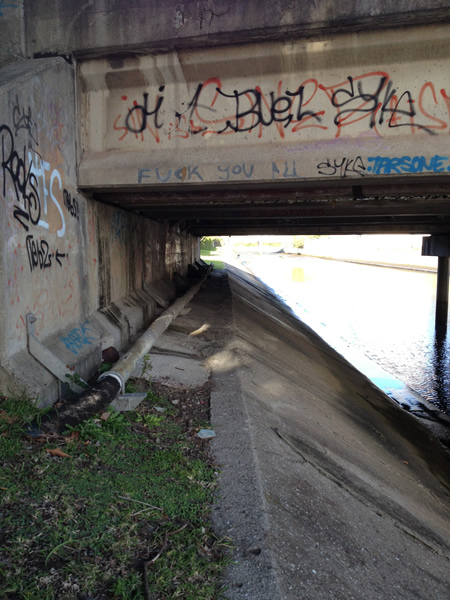 If we go as far as the TAFE litter boom then I have to stoop under the Chinchen Street road bridge. I call it koshinage bridge as this is where I get to practise my “silver-back gorilla” walk, an important part of getting in a decent hip throw in judo or aikido. And on the way home I always get out of the drain at the same spot. This joint between two slabs has a couple of erosion points that are good for getting a toe-hold, so I always get back up here. Always. I used that word “always” a lot, I know. I sound a bit OCD, and I think I am. But I like it. I’m a creature of habit. English is a pretty good language. It’s got a stupidly large and insanely flexible lexicon and so it’s disconcerting when you see or feel something and don’t have the word for it. I found myself in such a situation this morning, Sunday, at Clyde Street lights by the old signal box. In olden times, which these days seems to be a period frighteningly close to when I was a young man in my prime, signal boxes like these were manned (yes, manned, not staffed – I’m willing to bet that only 1950s Soviet Russia had lady signal operators) by men who pulled great big levers, levers that wiggled the points back and forth and sent locos to wherever they were supposed to be going. Like everything that once required human effort, there’s now an app for it. Or something electronic that dwells in “the cloud”. So I’ve been watching the demolition guys over the last few weeks as they strip the box of its asbestos sheeting and prepare it for its final destruction. 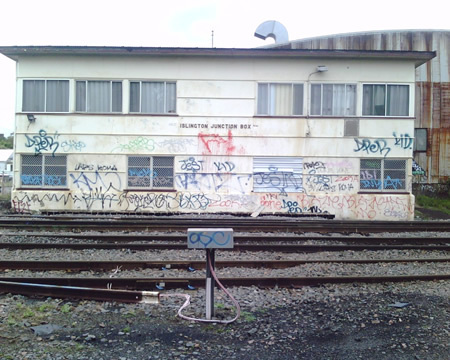 For a while it stood naked, just its oregon timber frame and the steel joists, and yet somehow it was still the signal box. On the second storey you can just make out the items that define this wooden-framed box and tell us what it once was; that is, the levers that the men pulled and pushed to move the points to send the trains along their way. As long as the levers were in place it was still, somehow, a signal box. But on Saturday afternoon, as Jambo and I headed towards the dog park, I heard a crushing, grinding noise the closer we got to Clyde Street lights. And there it was; or, rather, there it wasn’t. 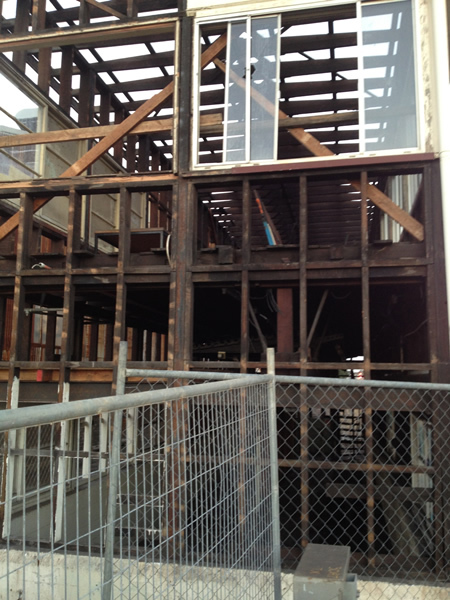 A big scoopy diggery thing had smashed it down: timber frame, steel joists, big levers and all. 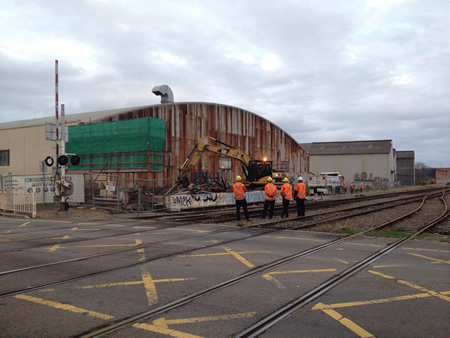 The Islington Junction signal box was no more. I felt sad – not necessarily for the asbestos sheeting and oregon timber, but for something else indefinable. Something that was focused on the row of levers. I got it into my head to go and get one, but there was still someone guarding the site quite late, and when I headed down on Sunday morning the crushing crew was already there, the huge mechanical monster crunching up the last remains and dropping it, scoop by scoop, int a waiting truck. I asked one of the guys if they’d taken the levers out first but he said, no, they’d gone the same way as the frame. He asked me why I was interested and I said that I didn’t know, that it just felt a shame. He agreed, and we stared in silence for a few minutes at the digger as it scooped up splintered timber, metal and busted levers and piled the dump truck high. That was when I felt the undefined sadness. It was a sadness partially for the loss of the building itself but perhaps more for what the building embodied: the thousands of hours of the presence of men working and talking and joking and arguing within its walls. The funny incidents. The narrowly avoided catastrophes. The pranks. The sadness. I have some photos of the interior from a few months ago. 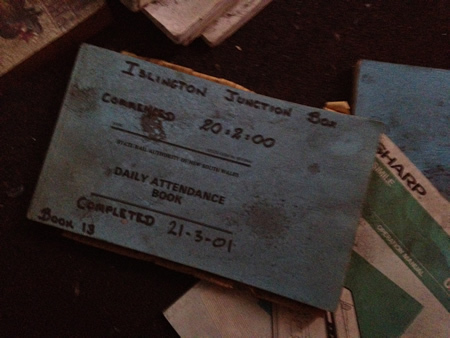 There were stacks of time sheets and log books that had all been filled in with great care and diligence, yet now they lay scattered among the filth and rat crap. 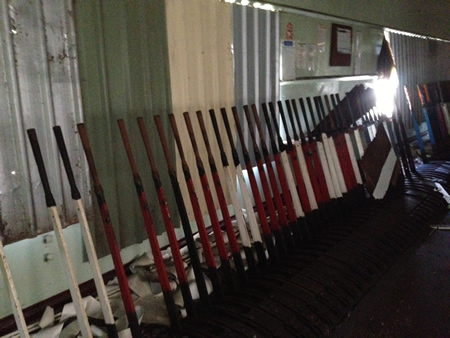 And the levers, all ranked in line and looking like they were ready to go back to work at a moment’s notice. I couldn’t think of an English word for what I felt. Not nostalgia, because I never worked in the signal box. Not poignancy. Not German Weltschmertz or Portuguese saudade or anything else that I could think of. Perhaps wabi-sabi, a Japanese term for “a way of living that finds beauty in imperfection and accepts the natural cycle of growth and decay”. That’s not bad. Wabi-sabi would fit for the feeling I get when I see tumble-down all cottages, such as this one at Tighes Hill. God, Nature is so literal. Last week it was autumn, season of mists and mellow fruitfulness, and everything was just lovely. 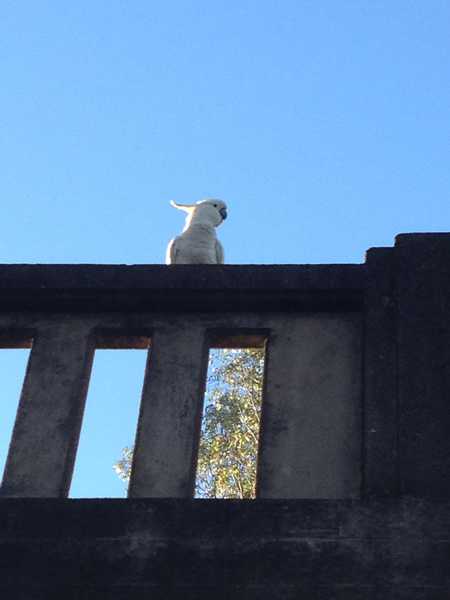 Clear skies, warm sun and cheerful birdies like this one looking down at me from the parapet of the Chatham Road bridge. 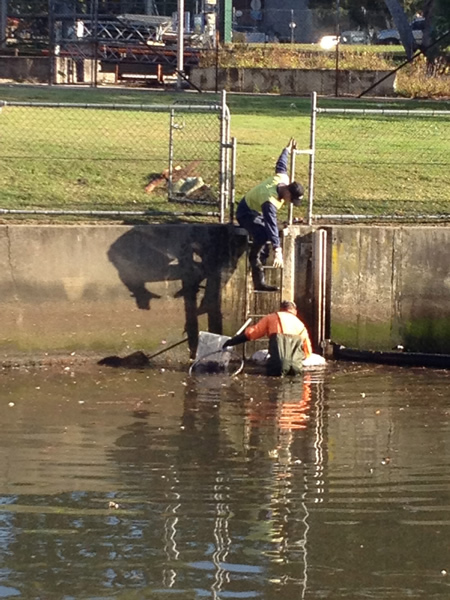 The clean-up guys were doing a stirling job, scooping rubbish out of the creek by the TAFE. There’s so much of it. It really never ends. Then the weekend came, and with it winter. It was like a switch being turned off. Or on. 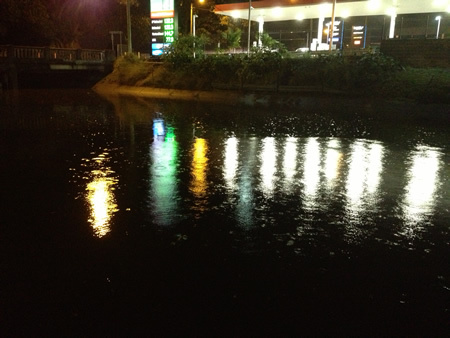 The temperature dropped by ten degrees and the rain came tumbling down. The creek was full so I had to find alternative walks for Jambo. 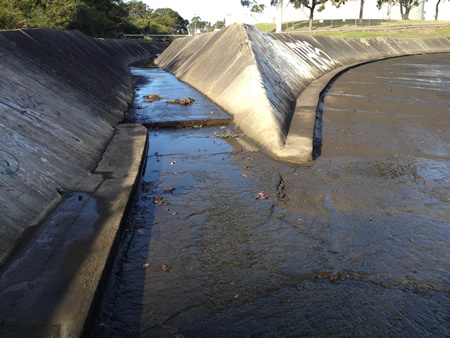 One that we tend to do when it’s really wet is to do a circuit of the TAFE college, around the football oval and back to the creek by Maitland Road. The Styx was full and dark and oily and very, very unwelcoming. On the way back home it started it belting down. And what else would happen on a freezing cold first-day-of-winter’s night with the rain coming down like stair-rods? 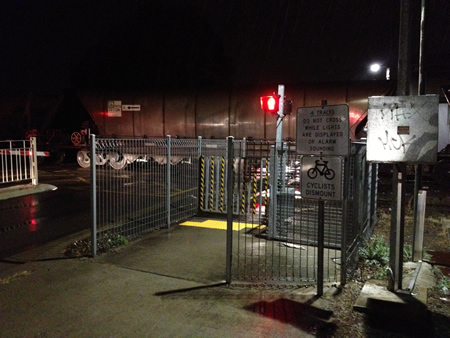 Of course, a coal train lumbers along just as I get to the lights. And then STOPS! That was the longest seven and a half minutes of my life. I’m still drying out. 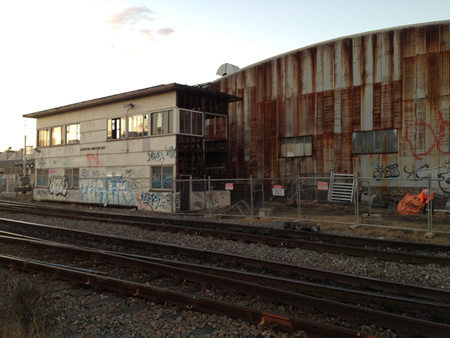 You are currently browsing the Hamilton North, NSW 2292 blog archives for June, 2013.